21st wedding of 2016 welcome Dr. and Dr. Davis! Sean and Laura, everyone! These two were incredible to work with and get to know. I received an email from them months back inquiring about the date and my services and I suggested we meet up for a coffee/drink to chat more in detail. Well – things were a little tricky being that they live out in California but thanks to the power of FaceTime we were able to have an over the Internet virtual beer and consultation meeting to start. 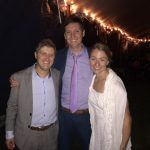 All three of us connected from the start and had similar music tastes and vibes which made prepping for this all that much for fun on my end. The wedding was being held on Saturday, October 1st out in Nahant Beach at this amazing private mansion residence in the backyard and on the beach. The weather was absolutely INSANE once the day arrived but we all got through it and managed to throw one hell of a party all said and done. Here’s some details covering the day. 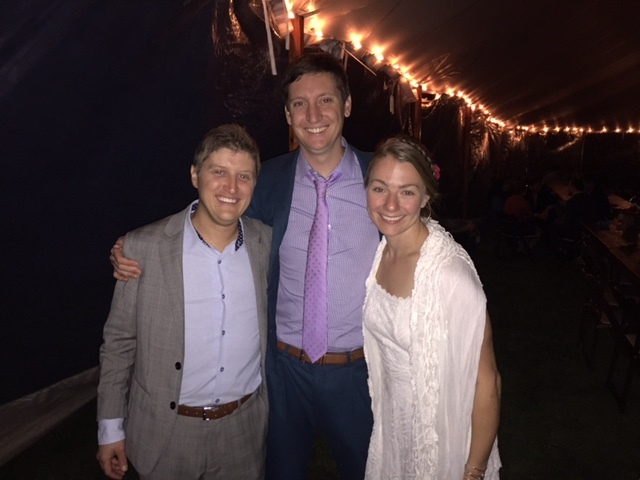 So after several FaceTime meetings and emails – I was lucky enough to actually meet these two in person a few months prior to the wedding when they were back in Mass for a weekend. They came by 90s Night at 6B Lounge and they had a blast. Such a fun and chill couple – just seemed nothing could really bother them. I even was able to fit in meeting Laura at another time she was in town to do a venue walk through. The plan was to do the ceremony down on the actual beach and cocktail hour, dinner, and dancing would be out in the backyard of the house under a tent. We had worked out the music specifics and timeline for the day and were all set to go, when all of the sudden, the WEATHER! It was chilly and pouring rain once the day arrived so we did have to relocate everything to inside the tent – but as I said they were SO chill it didn’t bother them. They just wanted to get married! And get married they did. They had a friend play live guitar for the ceremony which I always love seeing a live element in weddings. It sounded great and Sean’s sister did a fantastic job officiating the ceremony. Once that wrapped up we went into cocktail hour – and even though it was crazy weather outside the tent – inside the tent the vibe was better than ever. People were loving the craft beers Sean had brought in and special beers he had made special just for the wedding. I cannot thank Sean enough still for slipping me a personal favorite of mine “Heady Topper” to drink during cocktail hour. The music was a mix of some chill indie rock tunes with some old school funk and soul. People were surely into it. We then went into dinner and music wise had a similar vibe mixing in some chill classic rock Dylan, Stones, Petty tunes as well. We had some really funny toasts/speeches done at this time of the night and went into parent dances shortly after. Sean and his mother dances to Willie Nelson “Remember Me”; while Laura and her father danced to Louis Armstrong “What A Wonderful World”. Up next was the newlyweds and their first dance which was a bit of a mix starting out with “As” by Stevie Wonder for about two minutes then transitioned into “Shut Up & Dance” by Walk The Moon to open up the dance floor. 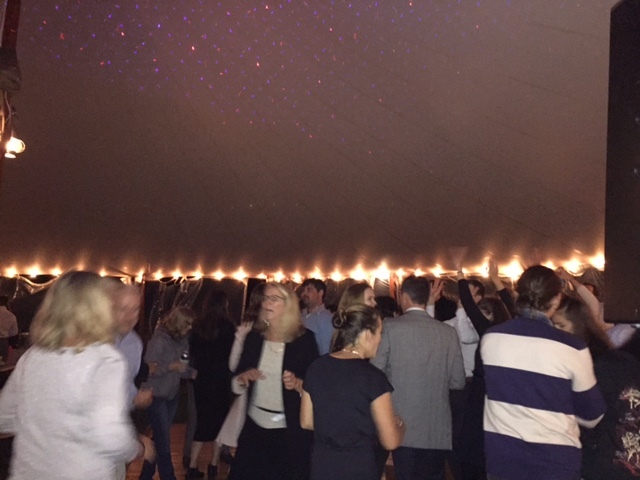 The crowd was AWESOME – it was such a fun mix of people loving the 90s throwbacks with some old school gems thrown in and some top 40 to keep it fresh throughout the night. Seriously cannot thank these two for being SO amazing to work with and so down to earth and open to any suggestions I would make along the way. 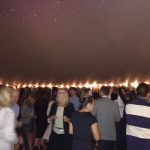 They have great taste in music as it is and as I said that made it very fun on my end to curate their playlists for the different parts of the night. Despite the wild weather – it was incredible and one to remember. I sadly didn’t have time to snap as many photos as usual but here are a couple below to check out. Thanks again Sean and Laura, CONGRATS to you both! I will let you know next time I’m out in Northern Cali so we can hang.